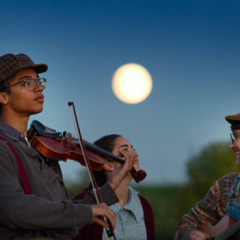 Under a moonlit sky overlooking central Pennsylvania’s rolling hills at the Dickinson College Farm, Theatre Professor Karen Lordi-Kirkham dissolved traditional barriers separating audience and cast members with her immersive, outdoor adaptation of John Steinbeck’s Grapes of Wrath. Rather than watch crew members bustling between scenes to change set displays, theatre-goers meandered from scene to scene on their own journey, as the setting transformed with each of the 14 open-air stations created by Assistant Professor of Theatre Design, Kent Barrett. The natural landscape of the farm enhanced empathy for a cast of downtrodden characters all seeking an escape from the environmental and economic disasters of the 1930s. The devastating combination of the Dust Bowl and the aftermath of the Great Depression led Steinbeck’s “Okies” (the Joad family) to pack up their belongings for the promises of greener pastures in California. Walking in the footsteps of the actors, the thin film of earth that had accumulated on the shoes of the audience members disappeared from view as the last gasps of sunlight turned to darkness, and hopes of a better life elsewhere for Steinbeck’s domestic migrants were dashed at each turn. Originally written “to put a tag of shame on the greedy bastards who are responsible for [the Great Depression],” according to Steinbeck himself, Lordi-Kirkham also shined a light on contemporary issues of migration, climate change, and economic inequality. “The issues in our country make this play thematically relevant,” Lordi-Kirkham said. “Even in Harrisburg there’s a tent city.” Barrett reached out to area farmers and tent city residents to explain the project and request consent to include their images in his displays. We wanted to focus on “How we think about people who have been forced out of their homes and how they’re struggling in a way that is not all that different from the Joads’ journey that Steinbeck is talking about,” Lordi-Kirkham added. “Part of the concept was setting the play on a landscape that had its own magic. It was different every night and everyone had a different experience because of different weather and feel of the day,” Lordi-Kirkham explained. 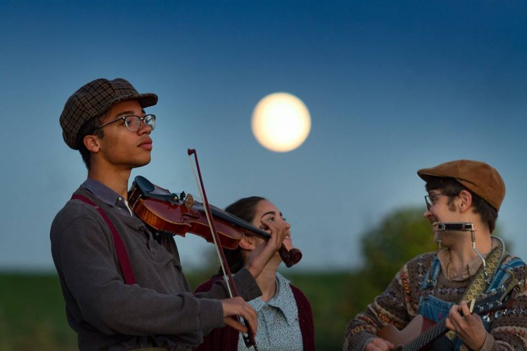 While it will certainly be difficult to recreate the beauty of a gorgeous sunset that transformed into a full moon rising during the square dance scene on opening night, the investment in LED lights for outdoor productions bodes well for the future of Dickinson’s immersive theatre projects.